The Nautica Queen is the perfect venue to host corporate events, weddings and receptions, showers, holiday and birthday parties, prom and after proms, spring or fall formals, or any special occasion. 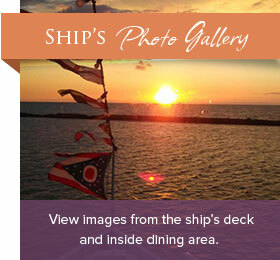 In addition to our delicious menu options, the Nautica Queen offers a full-service bar. The type of service will be selected by the event host. Please refer to our options below. For additional information, questions or to plan your event with us, call 216.696.8888. All drinks placed on the Host(ess) tab. Drinks charges will be tallied based on actual consumption. Drinks are charged, per drink, at the prevailing drink prices. Drink tickets may be requested in advance through the Group Sales Office. Drink ticket charges will be tallied based on the actual consumption for redeemed tickets. Per person pricing is available. Please inquire with the Group Sales Office. Pricing starts at $16.95, plus tax and service charge. Pricing varies by cruising time.